Chicago Marine Canvas offers boat covers in Chicago for all types of power and sail boats including bowriders, center consoles, convertibles, cruisers, cuddy cabins, flybridges, pontoon, runabouts, yachts, ski boats and more. 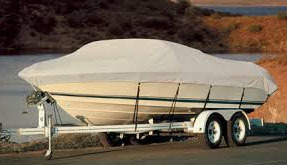 Boat Covers can be used in while your boat is moored at the harbor or for trailering your boat. No matter how you plan on using your boat cover in Chicago, we have the right solution for you. All of our quality custom boat cover solutions utilizing state of the art technology. By elimination added costs and time involved with templating or taking hand measuring, we’re able to get you a beautiful boat cover that is tight fitting fast! We also partner with the best marine canvas brands such as Sunbrella, Stamoid, Sea Mark, Herculite, Weblon Regatta, Strataglass and Crystal Clear 20/20. This combination will give you a premium boat cover that will last for years. Aft Cover: Aft Covers are one of the most common types of boat covers in Chicago you’ll see due to the overwhelming amount of cruiser style boats you see in the harbor . If you boat has a radar arch it will extend from the back of the arch down to the back of your boat. Most of the time it will extend around the port and starboard of the aft of your boat but not all of the time (although that is uncommon in the Chicago area). Aft Covers can be all canvas, have a eisenglass window in the back or be entirely made from eisenglass but the last style is more common on complete enclosures. They are attached to other canvas panels and/or a radar arch with zippers and then to the boat by snaps. Cockpit Covers: This is also a very common boat cover in Chicago that is found in all of the harbors. It’s for the boat owner that doesn’t plan on spending much time on their boat during bad weather and just wants to enjoy those sunny days. It’s a very easy boat cover to take on and off since it’s secured with snaps around the windshield area, port, starboard and aft. Most of the time it is “tented up” in the middle of the cover with a pole so water can easily flow off the canvas boat cover. Fly Bridge Covers: Even if you have a fly bridge bimini top, a fly bridge boat cover is a great way to go. It’s an easy option to toss on your fly bridge when moored without having to put up enclosure panels around your bimini top. These can be made with a heavier material such as Stamoid which will provide a waterproof cover that will never get any electronics or carpet wet. It’s a very cost effective option when protecting an expensive investment. Mooring Covers: These are the most common types of covers that can be found on many types of boats. Mooring covers can be snapped down around the topside of your boat or extended beyond the rub rail as shown in the illustration. A mooring cover can be modified to be used as a trailer cover which will then have tied down straps that typically wrap around the bottom of your boat for maximum security. Mooring covers can also be used during winter storage but you want to be sure that there is enough “pitch” in the canvas cover so snow and other blown debris can easily slide off and not get caught on and sag your cover. Sail Covers: All sailboats need a sail cover. They are inexpensive options that protect a very expensive part of your sailboat. Sunbrella fabric is a great option since it’s available in over 75 color options and can be easily embroidered with our sailboats name or other markings of your choice. They are commonly secured by zipper over your sail but some prefer using snaps so there is zero chance for your sail to get snagged up, it really depends on personal preference. Windshield Covers: For those looking to leave no item uncovered, a windshield boat cover is for you. It provides maximum protection for an important part of your boat and also prevents the sun from warming up your air-conditioned cabin on those hot summer days. Windshield covers are found on larger boats since on smaller boats you can extend a cockpit over down over the windshield if desired.